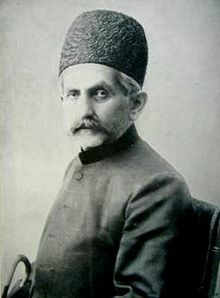 Sardar Asaad Bakhtiari (1856–1917) (Luri/Persian: سردار اسعد بختیاری), also known as Haj Ali-Gholi Khan, Sardar Asaad II (born Ali-Gholi Khan) was the 3rd son of Hossein Gholi Khan and an Iranian revolutionary, a chieftain of the Bakhtiari Haft Lang tribe, he was one of the primary figures of the Persian Constitutional Revolution. In 1909, Bakhtiari tribal forces under his command with help of modern arms from German Empire successfully captured Tehran as part of the revolutionary campaign to force the central government to establish democratic reforms. Commemorative poster (3 x 4 m2) pertaining to the conquest of Tehran by the Bakhtiari Constitutional Revolutionaries in July 1909. The two men on horse are Sardar Asad and Sepahsālār (Mohammad Vali Khan, Sepahsālār-e A'zam-e Tankāboni, Minister of Defence in the first Cabinet following dethroning of Mohammad Ali Shah Qajar in 1909, and subsequently Prime Minister of Iran from 6 October 1909 until July 1910). Lily Sardarian Bakhtiari, Bakhtiaris and the Constitutional Revolution (A Summary): . Bakhtiaris and the Constitution — Photographs: . Genealogy of the Haft Lang branch of the Bakhtiaris: .